After breakfast takes a sight seeing tour of Bombay, drive to Gateway of India and from here cruise by motorboats to Elephanta Caves. A flight of 100 steps takes you to the top of the hill where it is set. The caves houses large pillars that seem to hold the ceiling which is made of cross beams. The picturesque presentations of the 9 marvelous sculptured panels, set on the walls are awe-inspiring. The most famous of the panels is the Trimurthi, or triple-headed Shiva, where the God is depicted as the destroyer, the preserver and the creator. Later in the afternoon cruise back to Gateway of India, one can have lunch at the Taj Hotel or other several good Restaurants like Leopold & Mondegar serving continental cuisine's. Later visit Prince of Wales Museum, Parliament House, Marine Drive, Jain Temple, Hanging Gardens, Return back to the hotel for overnight. Note: Elephanta Caves and Prince of Wales museum are closed on every Monday. After breakfast, you will be leaving for Lonavala, The Ultimate Tourist Destination. After you get yourself refreshed we have for you a trip in store, which will cover Karla & Bhaja Caves. Overnight at hotel. Morning after breakfast, check out the hotel and proceed to the lovely locale Matheran. The day will be kept free, so as to relax and explore the fabulous surroundings. One can visit different viewpoints like Chouk, Panorama, Garbut Point, Louisa, Echo. After visit drive back to the hotel. Overnight at hotel. Today morning after breakfast check out the hotel and drive to Shirdi. On arrival check in into hotel. Move towards most reputed temple in Shirdi. "The Temple of Sai Baba of Shirdi". Spend your day at the sacred atmosphere of Shirdi. Roam around in the spiritual atmosphere. Overnight hotel. In the morning, after breakfast you will be driven to Aurangabad. On arrival transfer to the hotel, Aurangabad is the is the most elaborate vase temples of India, although Buddhist monks began excavating in the seventh century, the site grew to include Hindu and Jain temples as the Buddhist faith waned in popularity towards the end of the seventh century. There are 34 caves - 12 Buddhist (Ad 600-800) 17 Hindu (around AD 900) and they are numbered in that order as you progress from south to North. After relaxation visit Daulatabad Fort. Originally the mountainous Deogiri fortress, it was an old Hindu stronghold, finally captured and plundered by deceit in the 13th century, later visit Bibi ka Maqbara, It is the tomb of Begum Rabia Durani, wife of Emperor Aurangzeb. Due to its similar design, it is popularly known as the mini Taj of the Deccan. Followed by visit Panchakki, an intriguing water mill, the Panchakki is famous for its underground water channel which traverses more than 8 kms to its source away in the mountains. Later return to the hotel for overnight stay. After breakfast, excursion to the famous Ajanta caves. Ajanta is one of the few historical and architectural marvels of India. Recognized as the World Heritage Site today, it was discovered during the 19th century by a group of British officers who were on a tiger hunt. The Ajanta group of caves, located deep within the Sahyadri hills above the Waghora, depicts the story of Buddhism that prevailed here during 200 BC to 650 AD. Ajanta’s wondrous cave temples are cut into the rocky sides of a dramatic crescent-shaped gorge, at the head of which is a waterfall that drops over the mountain rim in a series of seven steps to a pool far below –deep inside the mountain are the Buddhist chaitya – vihara prayer and monastery caves. They cover a span of 800 years where under the royal patronage of ruling dynasties, professional artists helped Buddhist monks to create magnificent murals narrating the story of Buddha in his cycle of incarnations, while simultaneously creating a painted record of the panorama of life in ancient India. Etched and painted in mineral dyes, the paintings have a languorous stylized beauty and magical eloquence. After visiting Ajanta Caves drive back to Aurangabad. Return to Aurangabad for overnight. 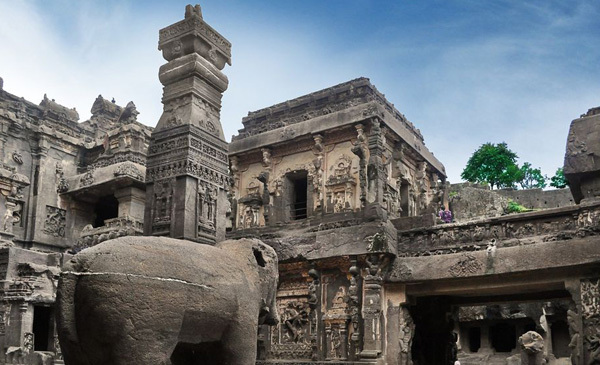 After breakfast take a sight seeing tour of Ellora, one of the highly visited World heritage sites of India. It houses 34 monasteries and temples with some exclusive uninterrupted sequence of monuments that date back from 600 to 1000 AD. The temples of Ellora are dedicated to Brahmanism, Jainism, and Buddhism. A particular interest are the architectural marvel of the monolithic Kailasa Temple, the Buddhist Vishvakarma Chaitya and Vihara, the famous Jain cave number 32 famous for a magnificent Yakshi statue and ceiling paintings. It also has some of the excellent stonework depicting the legends related to Lord Shiva. Return to the Aurangabad for checkout and drive to Pune. On arrival transfer to the hotel. Overnight stay in the hotel in Pune. Note: The Ajanta Caves are closed to public on all Monday and Ellora caves on Tuesday. After breakfast take a half-day city tour, and then continue your drive to Mahableshwar. On arrival check transfer to the hotel. Overnight at hotel. Today morning, after breakfast you will visit this beautiful hill station. It has pleasant walks & good lookouts, and the area has interesting historical connections with Shivaji. Afternoon you have an opportunity to go to Panchgani. It is also a popular hill station and splendidly located. Overnight at hotel. Today, early morning you will be driven to Mumbai. On arrival transfer to the hotel. After getting refreshed, you will be free to relax in the hotel. Overnight at hotel. Today after breakfast you can take a visit to the city life of Western Suburan visiting Iscon Temple and shopping at the big malls like Shoppers Stop, In Style, West End. If you are staying at South Mumbai, you can visit to Gateway of India, Marine drive also known as queens necklace in the night, Mahalaxmi Temple and for shopping visit to Cross Road, Phoenix Mill- Bombay Bazaar. In time transfer to international airport to board the schedule flight back to home.